Late on Tuesday, Apple updated its iBooks iOS app with several new features, as well as including some stability and performance improvements. 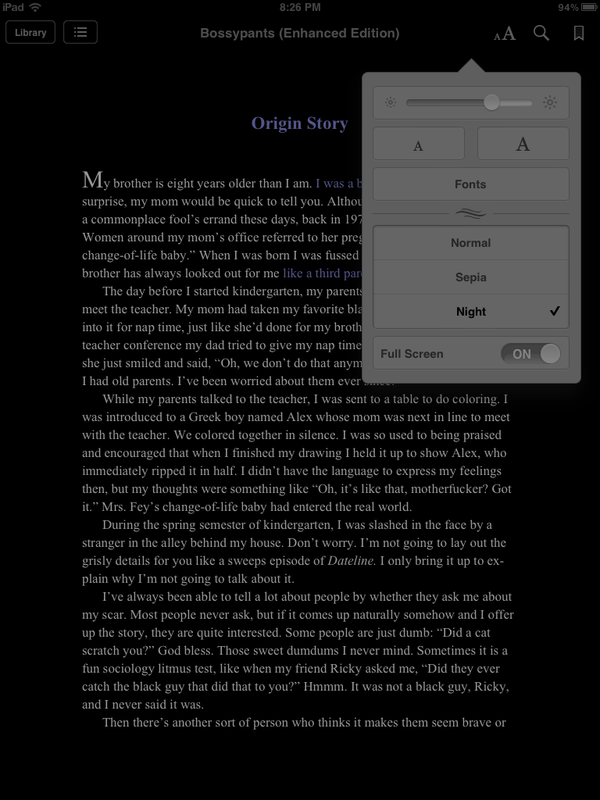 iBooks 1.5 adds a Night theme that turns the background black and the text white to make reading in a dark room easier on the eyes—and less intrusive to anyone else who may be around you. You can still choose Normal (white background, black text) or Sepia (yellowish background, black text) options as well. The new Night theme, viewed in Full Screen mode. A new Full Screen option lets you get rid of the rounded corners, stacked pages, book jacket graphic, and other attempts to make reading in iBooks feel like reading a printed book. iBooks 1.5 adds four new font choices—Athelas, Charter, Iowan, and Seravek—and removes three—Baskerville, Cochin, and Verdana—in the process. Apple also mentions new classic covers for public domain books, and a redesigned annotation palette makes it easier to choose a color for your highlighted text. 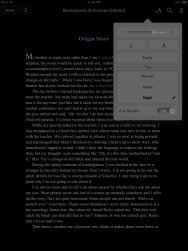 iBooks 1.5 is a free download from the iTunes App Store.